I've just finished making myself a pair of Monkey socks in some Cherry tree hill yarn from my stash. This pair knitted up so much quicker than the pair I made for the monkey swap last year!!! There is a definate advantage to having size 3 feet:-) I love this pattern though, and its great for busy yarns too! I like to have a pair of socks otn most of the time, but can't decide which pair to make next. I've been wanting to make a pair of Jaywalkers for ages, a good couple of years, but had a pair of zebra ones in mind. 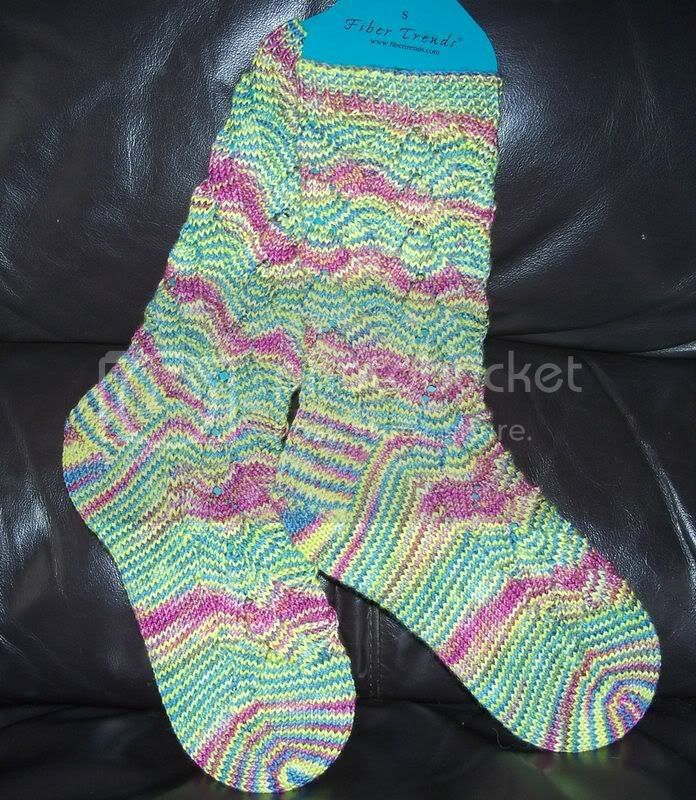 I've got the zebra yarn, and they were going to be my next pair of socks, but that jojoland quartette that I got for my birthday would look great for this pattern too, so now I can't decide:-( Plus, I've yet to start the socktopus club sock pattern from december, so I could cast on for those???? 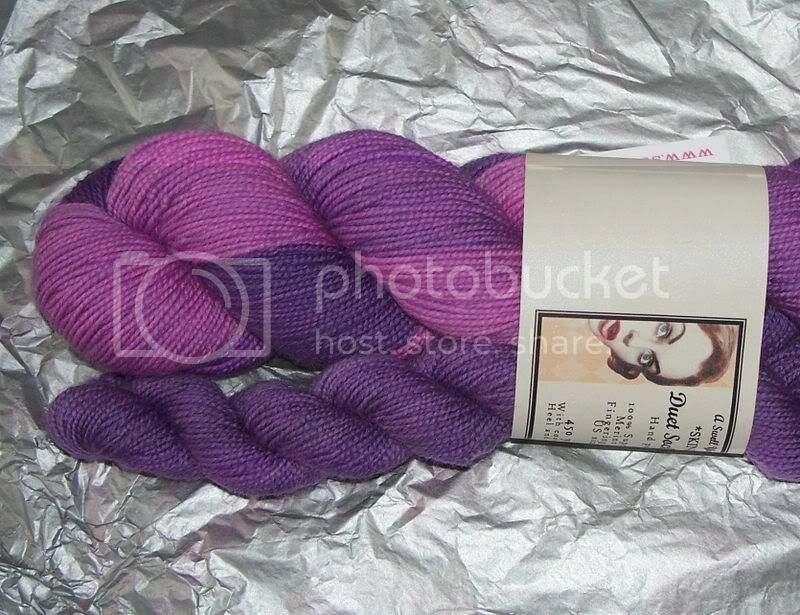 The Lovely Piglottie sent me a voucher for Socktopus for my birthday, so I chose this lovely Duet sock yarn! It's so pretty, I'll have to have a think of which pattern to use it for to show it off to its full potential though!!! I bought myself the Jane Brocket book before christmas, and have been reading it over the past week. Its a great book, full of amazing photography, and loads of crafty inspiration. Having seen her cupcakes, I decided I'd make myself some, I mean, it can't be that hard to bake and ice some fairy cakes can it:-) Actually, the cakes turned out really nice, very tastey! DH had one warm form the oven, but I told him to wait for another as I was going to ice them! As we're now into February, a quick update on my stashalong......... I haven't bought ANY yarn!!! None whatsoever:-) Its been relatively easy too, I've just hunted through what I have and planned what I'll make next rather than looking at new yarns and searching for a project to use them on!!!! DH says I've received as much yarn as I would have bought...........obviously many of my purchases were hidden prior to his return form work LOL!!! I'll leave him happy in that thought!! Ah - less is more terri! They look good enough to eat from here though. And what a lovely birthday you've had :-) beautiful yarn from Socktopus. I've been wanting to knit Jaywalkers for a long time, too. Zebra ones would be great. Size 3 Monkey Socks? What teeny-tiny feet! They are cute! Ah icing - I always think I'm adding the tiniest drop of water :o) Yummy athough, as are the monkeys. I love your Monkeys, and the Duets yarn is gorgeous. I would like the Jane Brocket book. And yes, from experience, I know the doom of water and icing :) I add the teeny tiniest amount, mix, then add the teeny tiniest amount etc. The cupcakes still look delicious though! Watch the sizing on the jaywalkers - I have size 5's and I haven't been able to make them work for me at all! Had a giggle at the icing story - but I would have been the same - I love baking but don't think i've ever iced anything. The stripes in the CTH work so well with the pattern. I am very envious of the Duets yarn but I am trying to be restrained - what is the texture of the yarn like? Nice monkeys & ditto the comment about jaywalkers. They have very little 'give' in them -mine got frogged! Lovely cakes, and lovely socks! It must be great knitting for small feet as it takes less time! Love your Monkeys, I just finished a pair myself, and "snap", I have size 3 feet too!! ee make more of those cupcakes and you'll soon end up the same size as me! I'll bet they were morish weren't they? I usually add the water to the icing sugar - safer that way - and the teeny tiniest amount. Have you tried lemon drizzle cake? 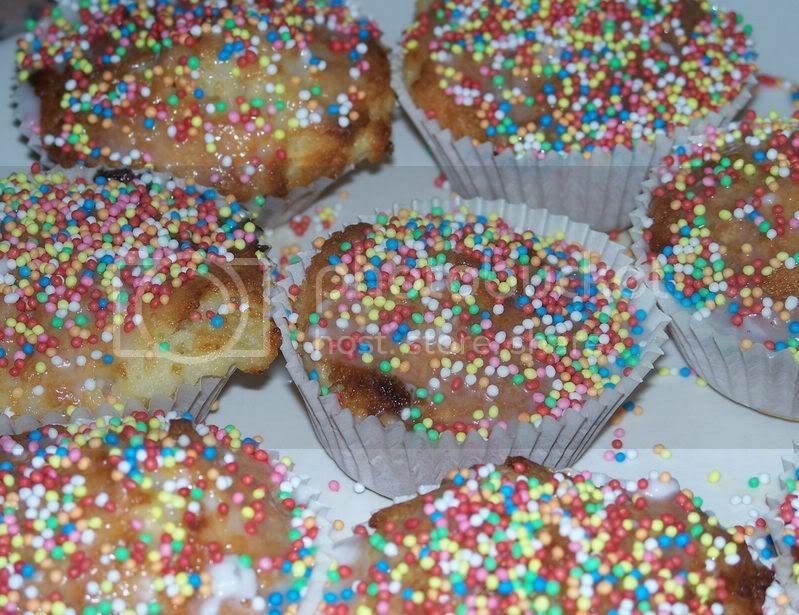 that uses lemon, sugar and water that gets soaked up by the sponge just like the icing did on your little buns. I love the yarnstorm blog - she has such a way with colour. Well done with your stashalong!